Row 6: ch 1, sc tog over next 2 st, 1 sc in each of next 2 st, sc tog over next 2 st, sc in next sc, sl st in beginning ch 1. Row 8: ch 1, sc in each st around, sl st in beg ch 1. (6 st around) Leaving a 6″ tail, fasten off. Stuff candy corn. Weaving tail through stitches at opening, pull tight and tie off. Weave in ends. When I sewed on the eyes and embroidered the mouth, I left the knots and tail ends at the back, because I was going to attach a pin onto the back and it would hide all the tail ends. Ready to take over the world! One candy corn at a time! Yarrrrrn. Um. Anyway. Please let me know if you do try making this, and feel free to drop me a note if you see any mistake or need clarification! 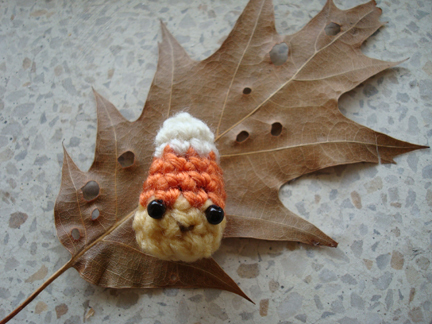 Hi there love your pattern, i have a tiny request, can you make a cocktail amigurumi pattern please!!!! that’s interesting, i might try tackling that when i have some time in august! 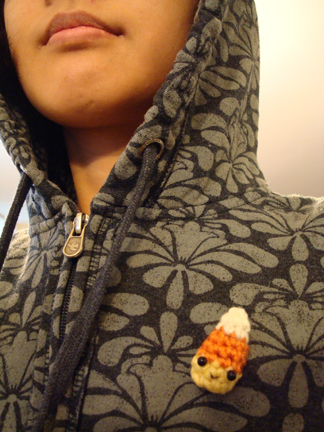 Teeny tiny Halloween crochet… I love it! Hope you won’t mind me linking up tomorrow at Tangled Happy. Wishing you a happy Tuesday! I will totally make this! 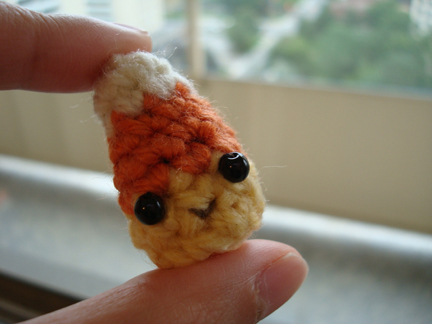 This is like the easiest candy corn pattern there is!!!! Thank you SO much for sharing this! 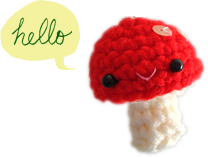 I am thinking about making a bunch of little crocheted things, and going to make up a game with them included! glad to hear that you like the pattern! happy crocheting!